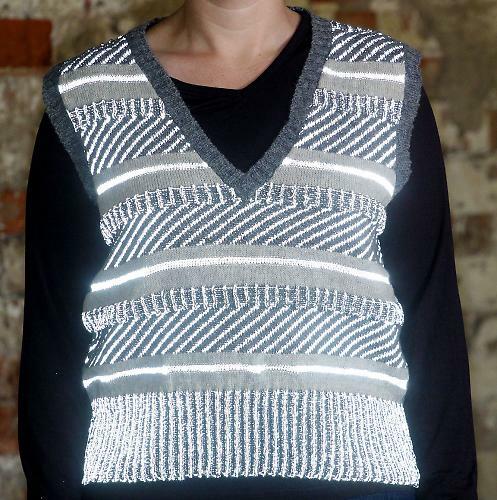 There's no denying the Dashing Tweeds Reflective Tank Top is an expensive item of cycling attire. £165 is a lot of money in anyone's book, BUT this is, after all, a truly unique and innovative piece of clothing, lovingly hand knitted on a small scale in England from pure new lamb's wool. The really impressive bit, though, and probably another reason for the hefty price tag, is the fact that the whole shebang is reflective, thanks to special yarns being knitted in with the wool. It's a tank top, and as such has a slightly nerdy, retro chic going on in the first place. As such, it's an item aimed squarely at the hipper cycling sort, but not falling into that category, I didn't let that put me off. I was intrigued by its woolly/reflective qualities. Sizing wise, the small was a good size as far as breadth went, but the top could have done with being a fraction longer in the body to make it a little more stylish and practical both. As it is, the fit was a little on the boxy side, irrespective of the gender of the wearer. Over a long sleeved top, it was surprisingly warm thanks to the wool, although, unsurprisingly offered little in the way of real wind protection. It kept my core nice and toasty though, and would be ideal for Spring, Summer or Autumn use. The really staggering thing about this tank top was the intensity of its reflectiveness. The quantity of reflective yarn used in each garment is considerable and, under headlights, it really shows. As well as looking cool and casual in daylight, this also doubles nicely as a practical aid to being seen after dark. It's hard to argue with that, even at the price. Unusual, lovingly made and genuinely highly reflective. Aimed at hip urban cyclists. And those who like a woolly jumper after dark. Hand knitted in England from lamb's wool and reflective yarn. Superb quality knit and materials. It kept me warm and it was AMAZING under headlights. The reflective yarn seems to want to unravel itself slightly, but with care this should last a long time. It needs to be hand washed as well. Very comfortable. A little on the itchy side, but you wouldn't wear it without something underneath anyway! Well made, from high quality materials and in the UK, but still expensive. An investment. Performed very well as a highly visible casual cycling sweater. HIGH levels of reflectivity, woolliness, relaxed style, made in the UK. Could have done with being slightly longer in the body, and the price was a bit of a wrench. Would you consider buying the product? Possibly, although I'd prefer to drop hints for presents. Would you recommend the product to a friend? Yes, to buy for me. You'll not see too many other cyclists riding about in one of these. Unusual and highly effective. a photo of it being reflective would really help, because all I can think of is that extra 1 in the price tag! Is this a joke... £165??!! Is it fashioned from elvish mithril? Does elvish mithril do that when you shine a light on it? Genius idea - wouldn't be seen dead in it though. And I can't think that it would be all that practical either... Now if they could do the same with a long sleeve merino jersey I'd bit their arm off! This garment in EPIC to the power of a million. I am very seriously considering one. Good review too, thanks Leonie. £165 for something that is seriously ugly and doesn't appear to fit properly? I would need to be really desperate to spend some money on something for this to get it! I thought the same thing. A lot of my clothes have a similar impact on the stomach area. At least I think it's the clothes. Dear $DEITY! Those are two of the most deeply unflattering pictures I've clapped minces on for many a moon. Somehow I don't think that it will persuade any viewers to spend Rapha/Assos-type funds on what resembles a shapeless woollen sack, no matter how hand-made & reflective it may be. Indeed, the only saving grace is that it lacks a content of kittens awaiting a watery fate. I have a dashing tweeds cap and it is a most rare & beautiful thing, with an eye-catching glint of lumi-twill. Please visit their website to see more picturesque and alluring sights than what appears to be an Etsy-reject.